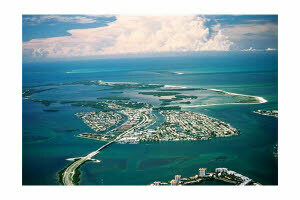 Beautiful and lush – Tierra Verde is located at the lower tip of the Pinellas peninsula. It was originally a group of mangrove and pine covered islands and for centuries the keys were only used by local Indians as ceremonial and burial grounds. Development of the area began during the Spanish-American War of 1898 when Fort De Soto was built on Mullet Key at the southern end of the chain of islands. Remains of the Fort still stand in what is now known as Fort De Soto Park, as well as additional fortifications on Egmont Key. Modern development of the islands began in the early 1960s with the founding of the community association and the construction of a bridge which allowed for easier resident and visitor access. Property sales greatly increased after the construction of the Pinellas Bayway exit ramp off Interstate-275 in 1984. Today, Tierra Verde consists of 667 acres of beautiful green islands laced with waterways which were scientifically engineered so that the Gulf of Mexico’s tidal actions help sweep them clean. There are now approximately 2,000 single-family homes and multi-family communities on Tierra Verde, as well as a number of commercial enterprises. Residents can fish the local waters, spot dolphin and sometimes manatees, sail to the Gulf of Mexico in minutes, and play on the beaches of Fort DeSoto Park. TripAdvisor lists Fort DeSoto Park as one of the top ten beaches in the country. Tierra Verde is an oasis tucked away in a prime location, allowing residents a short 10-minute drive to downtown St. Petersburg or an easy 25 minute drive to Tampa International Airport.